© 2004, BLT Research Team Inc.
from the photographer or illustrator. Description of Event: In the early morning of July 22, 2000 Mr. Jerzy Szpulecki, a farmer in this rural area of central Poland, was working late at night on a new house he was building on the edge of a wheat field farmed by his neighbor, Tadeusz Filipczak. At 12:15 am the lights in his house suddenly went out and he came downstairs to check for a short-circuit or other possible cause. As he reached the first floor he could see, through the large windows in the front of the house, that all of the street-lights on the nearby road were also out, and that there were no lights in houses nearby. 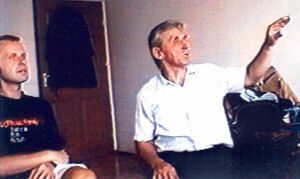 Mr. Jerzy Szpulecki, eyewitness to crop circle being formed in wheat field on the night of July 21/22, 2000 in Wylatowo, Poland. 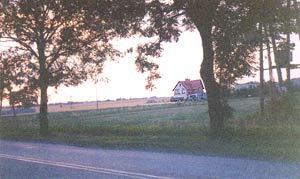 Mr. Szpulecki's house with unobstructed view of large wheat fields in front. Houses nearby also lost electric power during, and after, the incident. Another view of the house from the nearby road, along which the street lights also failed as the object approached the wheat field. Almost immediately he then saw a "strange" red light in the sky coming down very slowly, toward the field in front of his house. The light was a very bright red, spherical in shape, about 20 m (65 +/- ft.) in diameter and, when first seen, was about 500 m above the trees on the left side of the field. As the light came closer he saw what looked like a turbulent and rotating misty "white fog" above the red light which--as the object descended about 80m out in the field and directly in front of his windows--then appeared to be "some type of craft." As it got closer it banked at an angle and continued to descend to the field, but very very slowly. 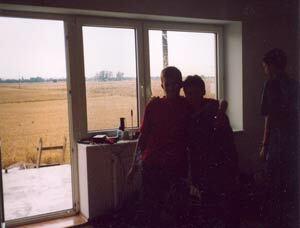 Windows through which Mr. Szpulecki watched firey red object slowly descend about 80m away into the field. At this point the glowing, bright red sphere seemed to be an outer shell of some sort, surrounding an inner white mass of fog, which was constantly swirling or rotating within the red sphere. As this strange object got closer to the ground it began to enlarge into a much bigger, but still round, object and seemed to "discharge something into the air around it." Mr. Szpulecki says that he thinks the "craft" was the "color of the white mist" (meaning that there was a white foggy material swirling around an actual solid craft, all of which was now inside the red sphere). He also had the impression that the surrounding red shell was "driving" the object inside. Brilliant red, slowly moving object, with rotating white fog-like material inside, as it came across the road & over the field. 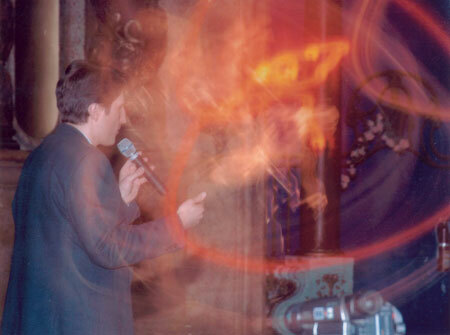 Mr. Szpulecki (with translator Slawek Paruszewski), describing the angle of descent of glowing red object into the field. As the object descended to about 20m above the ground he began to notice a "pressure" on his body, and as it got close to the ground sparks erupted, "like a short-circuit. ... I saw it touch the ground ... when it touched down there were brilliant flashes, like lightning." And, as it landed, multiple "arms" suddenly extended out of the center of the object, slowly bending down to the ground. At this point the red glow became so bright "it was hard to watch because it hurt my eyes." There seemed to be four of these "arms" (tentacle-like protrusions, which angled down toward the ground), and which were all the same length and bluish in color--and on the ends of each of the "arms" there was an even brighter, round, violet-colored light-ball. These violet light-balls were the brightest part of the whole object and were "very difficult to watch" because the brightness hurt his eyes. Illustration of object as it was touching down, with extended bluish "arms" tipped with brilliant violet-colored lights on the ends. Mr. Szpulecki was not completely certain about the number of these protruding arms, saying first that there were four of them, but later saying there may have been five or six. His primary impression, though, was that there were only four. At this point the witness noticed that there were at least three cars stopped on the road next to the field, their occupants apparently also watching the object. The next day he heard from other villagers that "many" people had seen the glowing red ball of light as it crossed the sky heading toward the field. Mr. Szpulecki reports that the object sat touching the ground for "at least a minute," with sparks flying and giving off an intense light, and that it was during this time that he became aware of a physical "pressure" on his body. This sensation of something pressing on his body, and particularly on his head, was noticed most as the "arms" were extended from the object as it settled down to the ground. Even though only the top half of his body was exposed to the windows, he is sure that he felt this strong pressure all over. He reported no typical electromagnetic effects (such as the hair on his arms, or back of his neck rising) and did not have a headache, and states that he smelled nothing unusual and heard no sound at all during the entire episode. On an instinctual level he was certain that this "energy" (as evidenced by both the brilliant light being given off by the object, and the pressure on his body) was not harmful to people. After what the witness states was about a minute the protruding arms retracted and the object, whose white swirling center continued to rotate constantly inside the red outer shell, rose into the air a few meters and then descended into the field again, a "short distance" away. Again the "arms" (with the brilliant violet spheres of light on the ends) protruded out of the object, bending down to the ground, and again he felt a very strong pressure on his body, particularly on his head. "Many sparks" also accompanied this second landing of the object, but this time Mr. Szpulecki states that they were "returning to the mist" instead of coming from it....that the sparks were coming up to the object from the ground. Finally, after sitting on the ground this second time for about a minute, the arms again retracted and the "red shell closed in again around the white center" so that all he could see at this point was the red ball of light--and the whole object started to rise, becoming smaller in overall size as it rose. Its red glow, "like a brilliant sunset," became so intense that it lit up the room in which the witness was standing. Slowly, it simply drifted away across the fields and disappeared in the distance. Mr. Szpulecki estimates the amount of time that had elapsed from when he first saw the object to when it disappeared as about 7 minutes. Although when he had first spotted the object he thought it was something "on fire," during the sighting it became clear that the field did not catch fire and he got the impression instead that this was something "other-wordly," maybe "extra-terrestrial." He states he was profoundly moved emotionally and completely awed and amazed by what he had seen, stating that "it was beautiful" and that he had not felt threatened or been afraid. This intense emotional response lasted for about half-an-hour after the object departed, "like after drinking a glass of beer." Again he reiterated that he felt this energy was not harmful to people. While interviewing Mr. Szpulecki (and on the videotape) it was apparent that he was still markedly moved by his recollection of this experience three years earlier. Mr. Szpulecki (with translator Slawek Paruszewski) describing the angle at which the object slowly lifted up and drifted away across the field. Since the electricity in the house was still out Mr. Szpulecki went back upstairs to retrieve his wristwatch before returning to his home and discovered that it had stopped at 12:15 a.m., the time when he believed the power had been interrupted. Because it was obvious that the wheat field was not on fire and because he had never heard of a crop circle (and therefore didn't think to check the field for one) he returned to his home in the village. The next morning a neighbor, whose house also faces the field in which the object had landed, informed Mr. Szpulecki that there was a strange marking in the wheat field --a pictogram-style crop circle which was, it turned out, flattened into the wheat in the precise location where the amazing object had landed the night before. Furthermore, the design of this pictogram (described by the neighbor as "something like a cross") was strikingly similar to the witness's description of the strange object itself with its "arms" extended, ending in the smaller violet light spheres on the ends of each arm. In another field on the north side of the road (only a few meters away) an additional 20m-diameter ringed circle was also found. Both men struggled to grasp the significance of the symbols, but were unable to "understand the meaning of the signs." 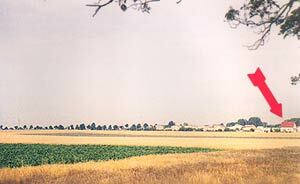 wheat-field on morning of July 22, 2000. 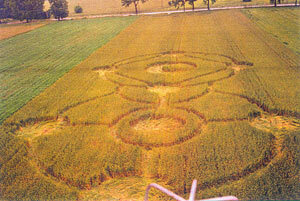 Crop circle found in wheat-field in front of Mr. Szpulecki's house by his neighbor. 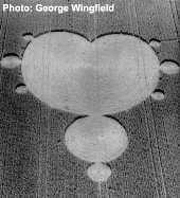 To our knowledge this is the only report of its type in the crop circle literature, the only time in which the landing of such a complex visual object has resulted in a crop circle which appears to replicate, in the laid crop, the observed geometic aspects of the object itself. 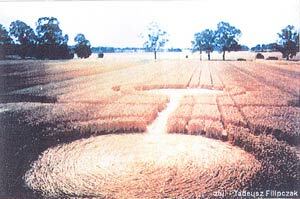 It is also the first eyewitness account of a crop circle forming in Wylatowo, although in 1973 a flattened circle was reported in the village of Zabno, about 5 km away, which was created by a "metallic, disc-shaped object" descending into a rye field there. It should probably be reiterated, however, that none of the Wylatowo residents we interviewed knew about this earlier event in Zabno, nor of the crop circle phenomenon generally, prior to Mr. Szpulecki's experience in 2000. It was Mr. Szpulecki's neighbor (who did not witness the events of the night before) who first found the Wylatowo crop circle and who told Mr. Szpulecki the morning after the event. He also presented the information that the electricity throughout the area was not working and that many local trucks and cars also had dead batteries. Later in the day the power company began working to repair the electric lines, reporting that the power was out in the entire area. They apparently were never able to figure out the source of the power failure. And over the next week or so it was learned that all the vehicles (cars, trucks, tractors) within about a 500m area around the field also had battery failure. Reports began to surface from other people who had seen the object while it was in the air, but it may be that Mr. Szpulecki was the only eyewitness to its actual descent and landing--at least the only local witness. It is unlikely that the vehicles which he saw stopped on the road next to the field were driven by locals (most of whom are farmers who are usually in bed by this time), and it is thought instead that they were driven by tradesmen traveling long distances through the night. Whether these vehicles were stopped because of battery failure is not known. 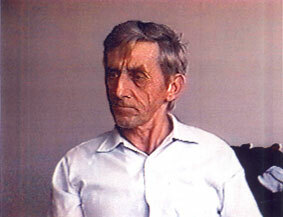 Mr. Szpulecki does not remember if they were still present when he finally went home after the incident. Two or three other crop circles were eventually discovered in the Wylatowo area during the summer of 2000 and in subsequent summers the phenomenon has continued to produce crop formations in these same Wylatowo fields (and in a few other areas of Poland) which, interestingly, seem to be both thematically similar to the original cross-like design found in 2000 and to exhibit a specific overall design character unique to Polish crop circles. On June 27, 2001 a crop formation was again found in exactly the same field where Jerzy Szpulecki had seen the firey red object land in 2000. This formation was a good deal more complex in design, and appeared to be an elaboration upon the original cross pattern. A good look at the formation photos for both years (lining up the trees along the nearby road) shows clearly that the 2001 event occurred in precisely the same spot in the field as had the 2000 cross pattern. In the second half of July, 2002 Milosz Kuss, a local boy from a village not too far from Wylatowo, discovered a crop circle in his uncle's fields. Milosz' family, like others in this remote region, had experienced several highly unusual events themselves over the past several years (one of which is detailed in BLT Report "UFO Incident & Trace Analysis, Golabki, Poland-1998," posted on the Jeff Rense web-site @ www.rense.com/general49/blt.htm) -- and Milosz had heard reports of the Wylatowo crop circles. 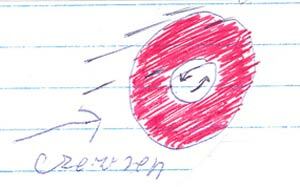 His drawing, below, of the circle on his uncle's farm almost exactly replicates the object which Jerzy Szpulecki described landing in Wylatowo in 2000. There is another incident--one which most people will probably consider as a very peculiar coincidence--but one that certainly adds to the extreme strangeness of recent events in Poland. On July 6, 2001, in the village of Lublin in southeastern Poland (about 400 km from Wylatowo), Mr. Robert Zmuda was fishing for his dinner and caught a large carp-like fish. When he hauled it into his boat he discovered an unmistakable, and definitely peculiar, marking literally embedded in the skin on the carp's side. This very distinct marking--decidedly cross-like in design--occurred in identical fashion on both sides of the animal. Because Mr. Zmuda, a fisherman for many years, had never seen anything like this before, he photographed the carp prior to dispatching it to his dinner table. Later on that summer Mr. Zmuda happened to see a TV show about the crop circles which had been occurring in Wylatowo, and one of the photographs aired was of the "cross-like" crop circle found in Wylatowo in 2000. Recognizing the similarity of design and even more astounded that he had been upon discovering the marking on the carp, he sent a copy of his strange fish photograph to Robert Bernatowicz, who was named in the TV show as an investigator of the Wylatowo crop circles. 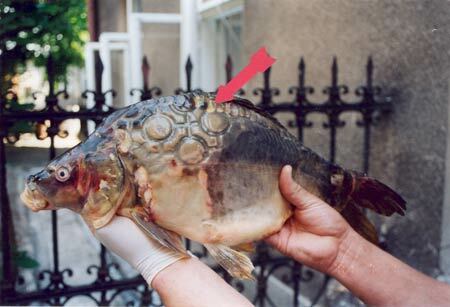 Photo of carp caught July 6, 2001 near Lublin, Poland. "Cross-like" marking was embedded, inexplicably, into both sides of fish. Diagram of pictogram and circle (inset) found in Wylatowo on July 22, 2000. 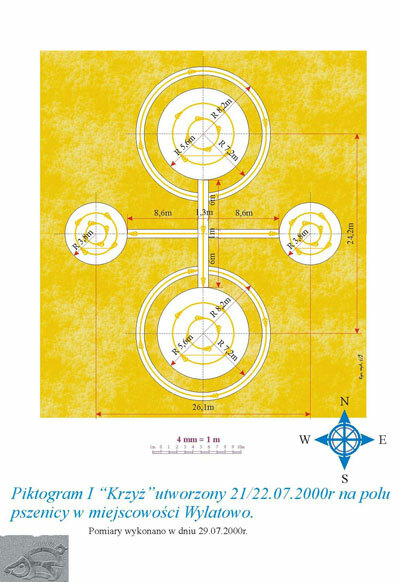 Many people described the formation in Wylatowo in 2000 as being "cross-like" in character, and the crop circle design at Golabki in 2002 resembled a Celtic Cross--and both closely approximated the firey red object which Mr. Szpulecki describes landing in the field in front of his house. Whether these events are in any way associated with the very similar mark found in 2001, embedded in a carp's body many miles away, is unknown, but in an overwhelmingly Catholic country with an enduring interest in spiritual matters it is surely understandable that a good deal of curiosity has been aroused. 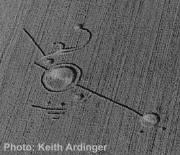 The crop circle phenomenon, by itself, is an ongoing mystery. Peer-reviewed scientific research (see "Published Papers" @ www.bltresearch.com) on a variety of plant and soil changes found in crop circles provides strong evidence that the majority of these events around the world are not mechanically produced. How it is possible for a carp to be marked in the manner in which this one was, is totally enigmatic. But what is very clear to everyone who has made the effort to obtain the facts is that each of these events (and others now coming to light in this remote area of Poland) is highly unusual and, to-date, unexplained. BLT Inc. thanks Mr. Jerzy Szpulecki, Robert Bernatowicz and the Nautilus Foundation, our translator Slawek Paruszewski, videographer Milosz Kuss, Mogilno Mayor Jacek Krasny and his able assistants Rafal Lukstaedt and Anna Bogdan-Ferreira, and the warm and charming people of Wylatowo, without whom this report could not have been completed. Many thanks to you all. Since this report was written a new event has occurred. Robert Bernatowicz, a Warsaw radio reporter with a strong interest in unexplained phenomena, began investigating the Wylatowo crop circles shortly after they were first discovered. Each summer he has returned to Wylatowo in an attempt to learn more about the circles and other strange events in the area and, in the last year or two, has witnessed first-hand a number of increasingly unusual incidents himself. Although well aware of the cynicism with which many people approach all matters unknown (and perhaps particularly those which might be thought of as possibly "spiritual" in nature) Mr. Bernatowicz has become more and more convinced that something truly wondrous--a new, and as yet unrecognized aspect of "reality"--is being demonstrated through the crop circles and related phenomena. On March 14, 2004 Robert was delivering a lecture in Chicago (U.S.) about the Wylatowo crop circles to members of the Polish community there. A journalist in the audience interrupted him at one point, asking how Robert could prove that the stories he was relating were true. Partly because Robert is not highly familiar with the scientific research carried out in the U.S., but also because his interest in the phenomenon is more intuitive and metaphysical, he did not reply by referencing the published scientific work. Instead, it occurred to him to answer that people should take photographs of him during his lecture, and that these photos would show "something strange" above his head. This idea had never occurred to him before, in other lectures, and in his email to me about this he says, "to tell the truth, I don't know why I did this." 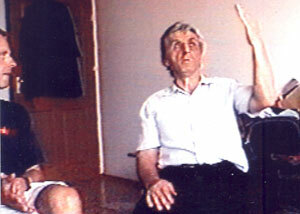 Robert Bernatowicz in Chicago on March 14, 2004, presentiong his lecture on the Wylatowo crop circles and other unusual events in Poland. This questioning about why the audience should believe Robert's remarkable stories occurred just prior to the point in the lecture at which the slide of the carp with the cross-like mark in its skin came up on the screen. As Robert was outlining this event to the audience and describing this "wonderful energy" he believes is involved in these phenomena, he suddenly became overwhelmed with strong emotions he could not explain, but which he described as "amazing," and which brought tears to his eyes. In response to Mr. Bernatowicz's instructions that people in the audience should take pictures of him during the lecture, a professional photographer in the audience (who was quite skeptical that "something strange" would appear above Robert's head) began shooting with his digital camera. Apparently, just at the moment when Robert became overwhelmed with emotion, the photographer observed something highly unusual on his LED screen: Robert's upper body was partially obscured by multiple semi-transparent, orangey-red streaks of light which appeared to be directed toward and around his head. 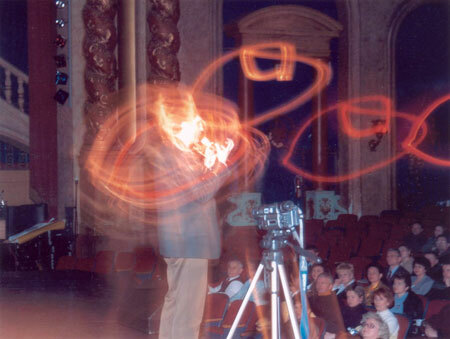 The photographer immediately took multiple photos, one after another as quickly as he could - all of which for several minutes following showed these same streaks of light. These are not time-lapsed photographs. It is reported that the phenomenon was not visible to anyone present, the light streaks being visible only on the LED screen and subsequent digital photos. Althought we are aware that strange effects can be created with digital cameras the photographer in this case was a professional, who states that he did not manipulate the camera in any way and that he did observe the light streaks on his LED screen while taking the photos. It is also interesting that (given Robert's emotional response to the discovery of the cropcircle-like markings on the actual fish in his slideshow) so many of the light streaks in these photos have a distinctly elliptical shape which is quite similar to that of a fish. 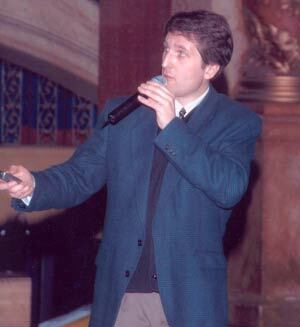 Digital photo taken March 14, 2004 in Chicago during Mr. Bernatowicz' lecture, while he was emphasizing the importance of the cross-like symbol found embedded in the flesh of the carp. Another of the remarkable photos taken during Mr. Bernatowicz' lecture in Chicago, while he was presenting his opinion that the Wylatowo crop circles are connected to a "pure energy spirit from God." [Footnote, early April 2004: The day after BLT had received these photos from Robert Bernatowicz' lecture in Chicago, an email arrived from Peter van den Broeke in Holland, recounting a similar event. 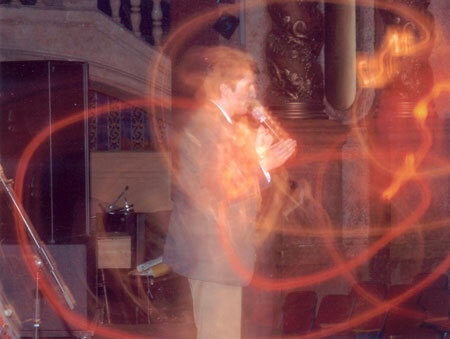 Peter's son, Robbert, who has for many years been able to anticipate when and where new crop circles will form in his region, had also recently given a lecture (March 28, 2004 in Antwerp), at the end of which a photographer in the audience (also using a digital camera) obtained strange photos of unusual light phenomena around Robbert v/d Broeke's body while he spoke. Peter also said that over the last year photos taken of, and by, his son have continued to record increasingly complex light effects, some of which exactly duplicate the photos taken of Robert Bernatowicz in Chicago. © 2004 BLT Research Team Inc.